From acclaimed playwright Anna Deavere Smith, a captivating work of dramatic literature and a unique first-person portrait of a pivotal moment in American history: the 1992 Los Angeles riots. Twilight is a stunning work of quot documentary theater quot that explores the devastating human impact of the five days of riots following the Rodney King verdict. 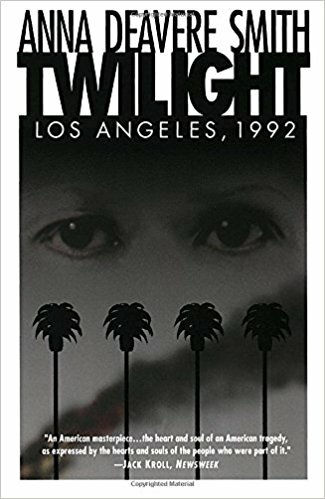 Twilight: Los Angeles, 1992 is a one-woman play written and originally performed by American actress, playwright and professor Anna Deavere Smith about the 1992 Los Angeles riots. The original Broadway production opened in New York City on April 17, 1994 and ran over 70 performances. The play is composed of a series of monologues by real people connected directly and indirectly to the riots; the text of the monologues is taken verbatim from interviews that Smith had conducted with them. The subjects/characters of the play include public officials like LAPD chief Daryl Gates and congresswoman Maxine Waters; a nameless juror on the Rodney King police trial, whose verdict directly led to the riots; various victims and instigators of violence, including, most famously, truck driver Reginald Denny, and residents of Los Angeles with their own view of the events, including singer Jessye Norman and actor Charlton Heston.